Double knitting is a knitting technique which I tried to learn previously but at the time I just didn’t get it. 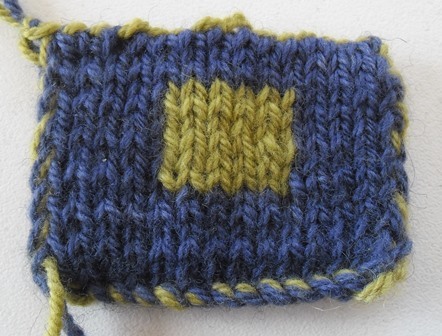 If you are not familiar with the technique double knitting allows you to create a piece of 2 coloured piece of fabric which is reversible so the image you have on one side is the same on the other side but with the colours reversed. It looks really effective. I have liked the technique for some but unfortunately I tried to learn it I just couldn’t understand it, I didn’t know how to read charts which didn’t help and I wasn’t that used to switching between knit and purl stitches as I am now. I had some projects I wanted to do but I was scared cause I didn’t know how to the technique. 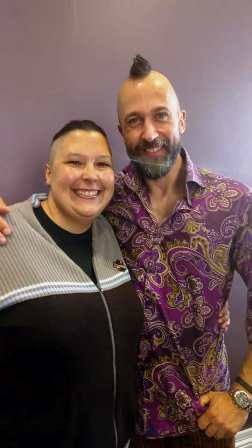 When I found out Nathan Taylor aka Sockmatician was coming to Australia and running a class on double knitting at Skein Sisters I thought here is my chance to learn. I’m not a total fan girl but Sockmatician is like the guru of double knitting. He has a knitting podcast and lots of tutorials on YouTube. His work is amazing so I needed to be in that class. I found out the date and time the classes were going to open on the Skein Sisters website to purchase a ticket and I literally sat there refreshing the browser on my phone every few seconds 5 mins before the time to ensure I could buy a ticket, I think I got like the first or second ticket. I’m so glad that I did he is an amazing teacher, from the minute he started speaking he had the whole room was engaged. The class was small with about 10 people and that was a good size as it allowed him to look around the room constantly as he spoke and make eye contact with everyone, as you student you could see the passion he had in his eyes as he spoke. He also has a slightly twisted sense of humour which matched mine so we got on really well. At the end we joked that we have the same hair style and by chance we have the same tattoo. Sockmatician is a really great teacher, he has a lot of patience with every student, he is very reassuring to remind you that you are only learning you will make mistakes everyone does but when you make a mistake I’m going to show you how to fix it. He really broke down the components of double knitting into basic steps, and emphasized what part of your knitting you need to be concentrating on as you work. The sample we worked on was a basic square of 15 pairs of stitches, double knitting is always done in pairs of stitches in which you will knit the first one and purl the second one. The pattern we were doing was a square within a square, we didn’t even actually follow a chart he just told us the instructions. We didn’t change colour the first so many rows which allowed us to get a feel for moving the yarn forward and to the back of our work as we did our knit and purl stitches, he then told us knit 5 and change your colour for 5 stitches than the change back to the original colour. That bit did catch everyone up a bit including myself but he went through how to fix it, which stitches to concentrate on and after that I was fine. I found it really rhythmic to do. I managed to half bind off my square before the class finished, had a I not stopped to listen and chat with a few people I would’ve got it finished. 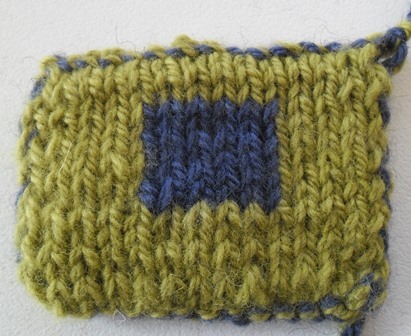 I am a very geometric person which is probably why I am drawn to double knitting. I am actually really proud of my test square. I really love it how the colours are reversed on the other side. We were given a handout during the class which included a chart to make a little heart test square which is the pattern he normally teachers. On the chart not only is the picture but he has also broken down how many coloured squares are in each colour block, for me that is much easier to work charts if I can break it down to a small chunk of stitches. Before the class had even finished in my head I started a planning a scarf using that heart chart, as I have previously mentioned I adore hearts. In my head I thought I might actually do 2 repeats of the chart to make the scarf the width of a regular scarf, after the class I mentioned to him that I was planning a scarf now with the chart and he suggested doing the 2 repeats and I told him that I’d already thought of that. In my mind I can see how it will look. I purchased some yarn to make the scarf so I am hoping to get it on my needles very soon. 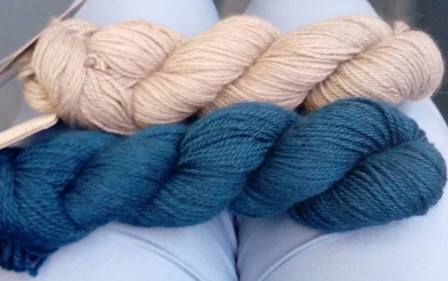 I was so excited about the yarn I took a photo of it on the tram on the way home. Sockmatician has an evil grand plan to take over the world with double knitting, each time he runs a class his aim is to get more people in his double knitting army. I’m part of that army now, double knitting has bitten me. Before the class I had 2 projects I wanted to do by the end of the class I had another 3. One thing he said is don’t be a student that is a serial class taker but doesn’t do anything with it. He wanted us to go away with the passion for double knitting and to use the technique, explore it and push the limits. That’s what I am going to do, maybe not push the limits at this stage but get out there and give it ago. If you ever get the chance to do a class with him I really urge you to do it as it was the best knitting class I have ever been too. Wow – a Sockmatician! Someday I want to knit a set of socks (well just one sock would be selling). Double knitting – wow – okay I am still trying to master single knitting! It is easy once you get the hang of it. Keep up with your regular knitting, start with a basic pair of socks I do recommend Rye by Tin Can Knits as a good sock pattern to start on as you knit with thicker yarn than regular socks and the tutorial that goes with this free pattern is really easy to follow. Sock knitting can be very addictive, I’m currently finding double knitting very addictive too.